Drying rates among the three species were very similar, though daily differences sometimes occurred. Initial moisture of the grass at cutting had a greater impact on final moisture content than did species. Though orchardgrass was 10 percent wetter than meadow fescue for initial moisture content in 2012, final moisture at the end of the third day was similar. 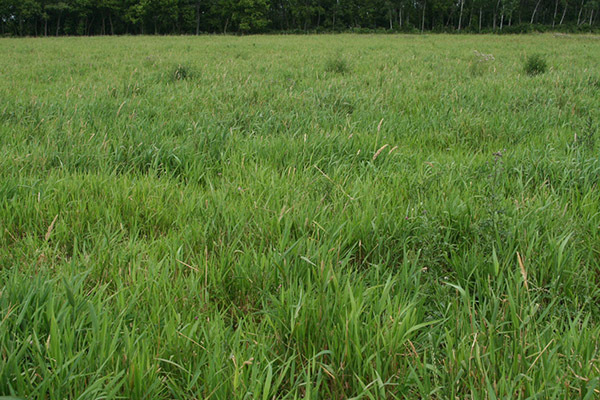 Forage quality was generally similar among the three grass species, though in 2011 reed canarygrass was significantly higher in crude protein (12.6 percent) than meadow fescue (10.5 percent). Also in 2011, meadow fescue had significantly lower NDF and higher NDF digestibility than the other two species. Swath width and conditioning appear to be the most important drivers influencing grass dry-down rate regardless of species.